There’s no hiding the fact that I’m a massive Splatoon fan. The inky Nintendo shooter is one of the reason’s I recently purchased a Wii U, and every time I see it in action I know I made the right decision. So you could’ve called yesterday an early Christmas for me, as a ton of new Splatoon footage hit the internet – and got it all messy. International media were lucky enough to get some new hands-on time with the upcoming exclusive and, while we haven’t yet had the chance, it did give us new looks at some single-player and multiplayer footage from the game. But before any of that, check out the brand new trailer for the inkling infested shooter, which gives you a brief run through of some multiplayer maps (with awesome backing music to boot). There’s even more 4-on-4 multiplayer footage to check out, which is similar to a lot of the gameplay we’ve seen already. Players have to try and paint the map with their team’s ink color, with matches being decided by the amount of territory you manage to paint. There’s also a ton of messy murder in between watching the paint dry. Splatoon just exudes a sense of unique style that draws me towards it. The closest thing I can compare it to is a modern Jet Set Radio. Fully of colour, bursting with weird and wonderful ideas and carried by excellent sound design and a kickass soundtrack. And that’s just from all of the footage Nintendo has released thus far. 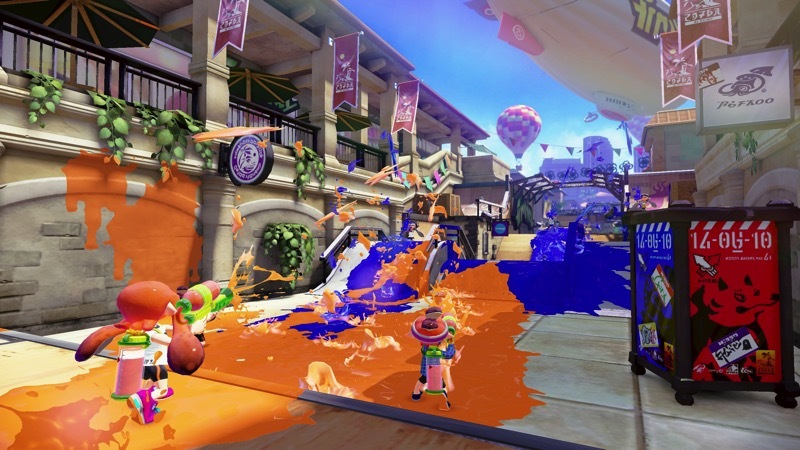 Needless to say, I’ll definitely be picking up Splatoon when it launches for the Wii U in May. Are you hooked yet?